Canada's advanced manufacturing sector is attracting attention and new prospects. Canada's advanced manufacturing sector is attracting attention and new prospects. The Economist Intelligence Unit's (EIU) business environment ranking places Canada first in the G7 and fifth in the world as the country in which to conduct business over the next five years (2010–2014). In 2010, the Canadian government announced the elimination of over 1,500 tariffs on manufacturing inputs and machinery and equipment, making Canada the first country in the G20 to become a tariff-free zone for manufacturers. 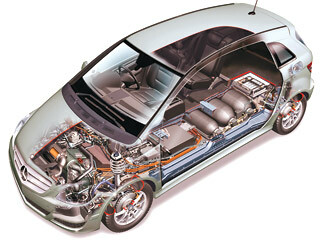 The automotive industry is a primary driver of the advanced manufacturing category. According to the Invest In Canada bureau, the country is the world's third-largest exporter of automotive products after Japan and the United States. Canada's automotive components industry consists of more than 1,000 manufacturing facilities. The bureau also touts Canada has having the second-lowest marginal effective tax rate (METR) for manufacturing among the top-10 auto producers — two-thirds that of the United States. General Motors made multiple announcements in Oshawa, Ontario, with the commencement of production of the Camaro convertible, news of ramp up of production of the Buick Regal, and the addition of a third shift to support increased production of the Equinox. The automaker noted that its two new shifts would create 1,300 jobs, translating into the return of all laid-off production workers as well as the hiring of 300 new people. Besides producing vehicles, manufacturers are preparing the energy to power them. British Columbia's fuel-cell cluster is the world's largest, in terms of both employment and number of companies, and Vancouver is North America's number-one center for U.S.-registered fuel-cell patents, reports the Invest in Canada bureau. The Automotive Fuel Cell Cooperation (AFCC) in Burnaby, east of Vancouver, was founded in 2008 as a joint venture between Daimler, Ford, and Ballard. In March, Mercedes- Benz announced the establishment of a new fuel cell stack production facility also in Burnaby. The fuel cell stack, now used in the current Mercedes-Benz B-Class F-CELL and its Citaro FuelCELL Hybrid city bus, was developed at AFCC. Construction of the fuel cell stack facility will begin immediately, with completion scheduled for early 2012. Following a graduated test and commissioning phase, small-series production will commence as of 2013. This next generation fuel cell stack also can be used in sedans such as the Mercedes-Benz C-Class or E-Class. At the announcement, Günter Walz, vice president of planning international cooperations for Mercedes-Benz cars, said, "The decision was made to create and build a new production facility under the aegis of Mercedes-Benz Canada as the logical next step of Daimler's successful cooperation with partners in Vancouver." Canada's targeted incentives and research facilities drive many of the auto industry's expansions: The $250 million Automotive Innovation Fund supports strategic, large-scale R&D automotive projects to develop innovative, greener, and more fuel-efficient vehicles; the $500 million Automotive Research and Development Centre focuses on alternative fuel, mechanical engineering design, engine/transmission design, advanced materials, emissions, bio-mechanics, and vehicle safety; the $145 million Automotive R&D Partnership Initiative was designed to foster an innovative and competitive auto industry through industry-driven research; and the $240 million Partnership for the Advancement of Collaborative Engineering Education focuses R&D in computer-aided design, manufacturing, engineering software, hardware, and training. Also involved in automotive as well as other manufacturing sectors is the plastics industry, which is concentrated in Ontario, Quebec, British Columbia, and Alberta. According to the Canadian Plastics Industry Association, plastics manufacturing has grown twice as fast as other manufacturing businesses over the past decade. Also, it has been less cyclical than some other sectors because of its broad range of end products. In February, Celanese Corp. announced the expansion of capacity at its Edmonton manufacturing facility for the production of ethylene vinyl acetate (EVA) polymers. The firm explained that global EVA production increases are fueled by growth in the photovoltaic cell industry in China and strong demand for EVA in other parts of Asia as well as applications such as medical packaging. Ontario, Canada's Technology Triangle — comprised of Waterloo, Kitchener, and Cambridge and four surrounding townships — is home to Toyota's Cambridge plant as well as a concentration of auto parts manufacturers, including ThyssenKrupp Budd, BFGoodrich, Dana, Tenneco, Lear Corp., and Trim Masters. However, according to John G. Jung, CEO of The Technology Triangle Inc., "Waterloo region companies also play a role in exploring 'what lies beyond.' Teledyne DALSA developed the camera used on the rover to send images back from Mars. Local company Ontario Drive & Gear is working with the Canadian Space Agency and NASA on a prototype lunar rover, while 80 percent of the satellites in space carry components manufactured at COM DEV in Cambridge." Besides outer space, aerospace is also an advanced manufacturing focus. Montreal is Quebec's aerospace capital, with 98 percent of Quebec's aerospace activity concentrated in Greater Montreal. The Quebec aerospace sector boasts a diversified offering of quality aeronautical and space products and services. Suzanne Benoît, general manager of Aéro Montréal, notes that Canada's aerospace industry includes some 235 companies employing 40,000 people, with more than 130 companies on the Island of Montreal. She adds that the aerospace industry ranks first in Quebec's R&D manufacturing sector. The Canadian military's procurement programs also contribute to the growth of aerospace and industrial spin-offs. In March, the department of National Defense of Canada announced the acquisition of the fifth-generation F-35 Joint Strike Fighter (JSF) jet program. Canada will invest in research and development to produce components for this aircraft. According to Benoît, as of March 2011, more than 85 Canadian companies potentially will be involved with the JSF program, with 60 of these already under signed contract. Full production is slated for 2015. Additionally, GE Canada and StandardAero are partnering to build a new $50 million aircraft engine research and technology development center in Winnipeg, Manitoba, that is slated to open with 10 employees and grow to 50 in five years. The facility will develop advanced testing methodologies and equipment for GE Aviation's commercial and military aircraft engines. Many of the provinces are also cultivating the photonics sector. More than 60 percent of Canada's photonics industry is based in Ottawa and Toronto, and British Columbia is home to approximately 50 companies in the field, in niches including lighting and signage, as well as in alternative energies. Alberta's photonics discoveries have led to applications for the gas and oil sector. By 2020, the government of Alberta expects its $130 million investment in nanotechnology to also help grow nano-photonics. Quebec's optics-photonics sector includes more than 100 companies employing close to 5,000 specialists in the industry. In March, the government of Canada announced a $45 million award over five years in nonrepayable funding to the Institut National d'Optique (INO). Granted through Canada Economic Development's Business and Regional Growth program, this funding will enable the organization to pursue its innovation commercialization and technology-transfer activities. The INO noted that during the next five years, it expects to spin off six new enterprises and carry out an additional 15 technology transfers in the greater Quebec City area.